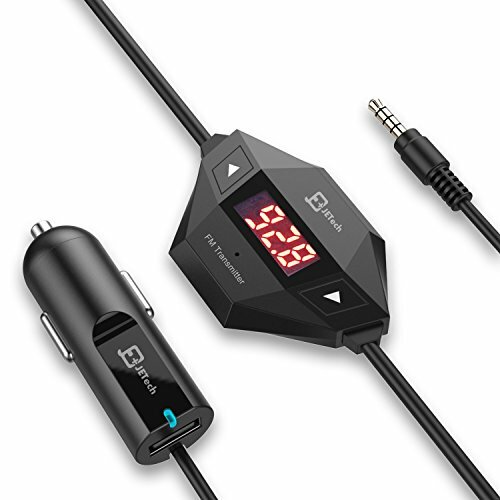 If changing your car's stereo is not your thing, then finding the best FM transmitter to stream your tunes could be your next best option. 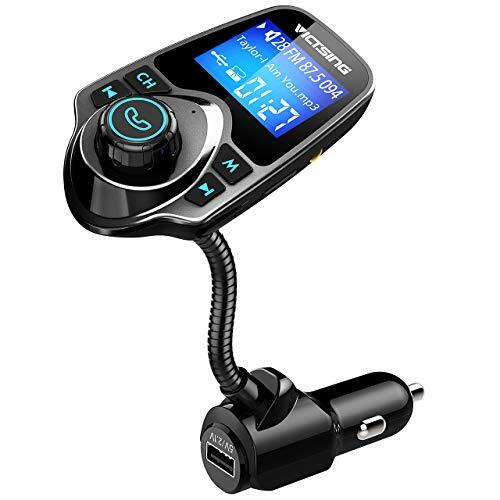 These days, it's all about Spotify and Apple Music when it comes to listening to music; and a bluetooth FM transmitter can be a great option if you want to use these services in your car or truck while on the move. 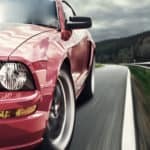 Car FM transmitters have been around for a few decades, and their quality has improved greatly over time. Back in the day, the sound quality wasn't always the best but advances in interference and noise cancellation technology have improved their quality. There are literally hundreds of different FM transmitters out there and we've selected a few that we think are worth considering. The VicTsing is a neat little transmitter that is a very popular alternative to an expensive head unit. You can connect your device using Bluetooth or an Aux cable, or you can play music straight off an SD card. The most popular file types such as MP3, WMA and FLAC are supported. Not every transmitter has an LCD screen, and it's handy for seeing basic information. This LCD screen displays information like track name, caller ID and even the car battery voltage. Even though this uses your 12V socket, you can still charge your device using the faster charge USB socket. It's rated at 5V/2.1Amps, so it should at the very least keep your device battery topped up while you drive. Finally, one of the most important features is the noise reduction technology. This one uses what they call CVC technology to suppress wind noise and interference. 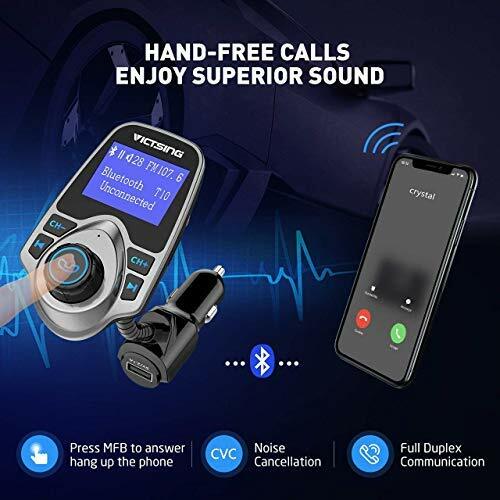 This unit also offers hands-free calling without the need for an extra microphone, as a high-quality microphone is integrated right into the FM transmitter itself. In addition, it provides advanced audio clarity technology to ensure that music (and voice) are clearly captured and transmitted, minimizing static or echoes. Our Opinion - Possible Negatives? As FM Transmitters go, it's hard to find any faults with the VicTsing. Personally, I prefer to use USB sticks to store music, so it would be nice if the USB port doubled up as reader too. I also think the charging capabilities of the USB port don't live up to the specs. It will charge your device, but probably not as quickly as a mains socket. The only other downside is the lack of a power button. This means if you have a car where the 12V socket is always 'live', then you'll need to keep plugging the transmitter in and out. 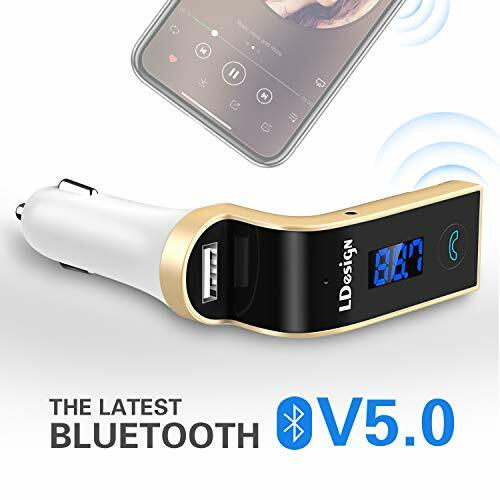 This particular bluetooth radio transmitter looks suspiciously like the Nulaxy Bluetooth Car FM Transmitter, and it's hard to tell if there is any difference between the two. This isn't necessarily a negative, just a bit odd! Overall, considering the cost of these devices, any negatives can probably be overlooked! 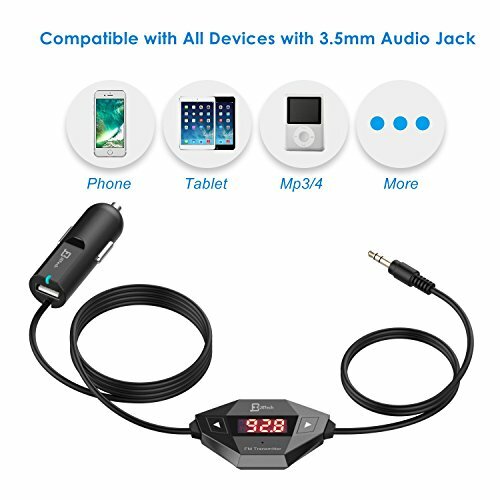 The JETech FM Transmitter is a wired FM transmitter that connects to devices with 3.5mm sockets. So while it may not work with the latest smartphone, it is a well built, no-nonsense transmitter that can transform an old MP3 player into an audio streaming device. This is a small device, so it the LCD screen doesn't display anything except the FM frequency. There are buttons either side of it, and that's all.The power plug fits any standard 12V socket, and has a hidden USB socket for charging your device. In fact, because the plug is connected with a cord to the transmitter unit, it can be used where the 12V socket is in a tight space or not on the dashboard. Despite not being a Bluetooth transmitter, it still supports hands-free calling in full duplex mode via the integrated microphone. You just need to answer or initiate the call on your phone instead of on the transmitter itself. There isn't really much else to say about it, except that it now comes with a lifetime warranty so you really can't lose! 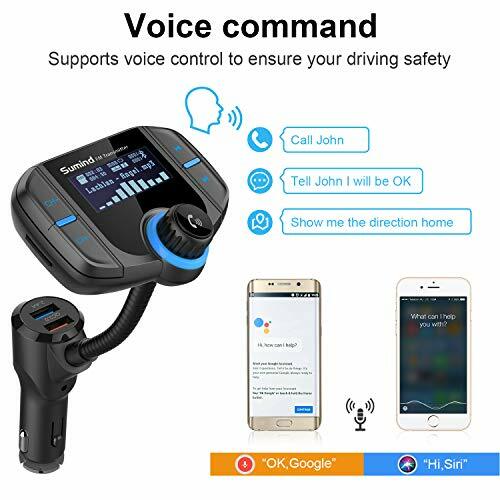 This device doesn’t support Bluetooth and doesn’t come with a lot of the extra features available on some other transmitters like track readout or caller ID on the LCD screen. It also doesn't allow you to play music from an SD card or USB stick. Overall though, it's good value and appears to be well made, so should last for years. 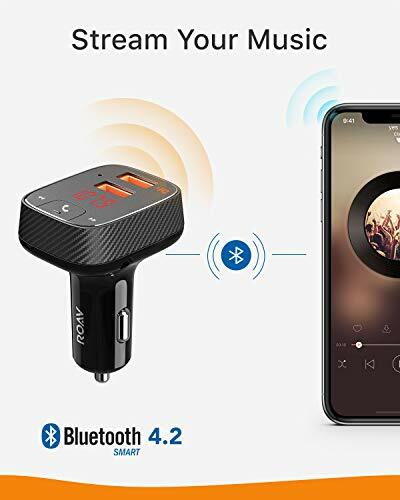 The is a simple looking bluetooth transmitter for your car that supports music streaming via Bluetooth 4.2, an auxiliary socket or USB. It features twin, fast charging USB ports, that allow you to charge two devices simultaneously. You can also use one of the ports to play music from a USB drive. An integrated microphone is included for full duplex hands-free calling, along with static-reduction technology for excellent sound quality. It also has advanced voice clarity technology for calls, reducing echoes and making sure the person on the other end can hear you clearly. 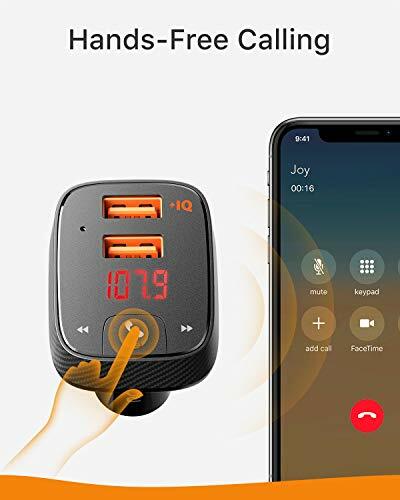 The Anker transmitter has some great features like the intelligent fast charge USB ports and it's noise reduction technology. There isn't really anything bad to say about it. If you are going to use it with an older device (not a smartphone), then the App isn't going to be much use to you. It's also not going to be compatible with every vehicle, or fit where the 12V power socket is partially hidden. Otherwise, it's definitely worth checking out. This LDesign transmitter is a bit different looking to the others. It's L-shape means it will fit into tighter spaces like an ashtray or flush against a dashboard if the 12V socket up higher. You can connect your phone by Bluetooth or using the 3.5mm jack. Once connected, it supports media playback and handsfree calls. The noise and wind suppression technology (CVC) should keep the calls static free, and the music quality clear. It can also be used as a portable media player by plugging in a microSD card or USB drive. It supports all of the usual formats (MP3, WAV, WMA, FLAC) and will read up to 32GB drives/cards. The LCD screen isn't too big (although it is advertised as 'large'?) and it gives basic information like radio frequency, caller ID number and battery voltage. The LDesign is a no nonsense FM transmitter. It's design may not be to everyone's taste, but if you are looking for something less flashy it does come in black or grey too. Whilst it does cover all the bases in terms of connectivity, it does lack a high speed USB charging port. The Sumind transmitter, has some cool features and is compatible with most portable devices, old or new. You can connect using Bluetooth or 3.5mm jack, for media playback and handsfree calls. A recent update (2017) has improved the reliability of the wireless connection and data speeds. Along with noise reducing technology, this should give clearer audio during calls. The dual USB ports support fast charging (5V/2.4A), but not media playback from a USB drive. There is a space for a microSD card up to 32GB, and and it will play MP3/WMA files. The LCD screen is fairly large, and displays things like song title, callerID and battery voltage and it can be adjusted to face pretty much any direction. One feature that makes this transmitter stand out from the others is the built-in voice command functionality. If you long press the main function button, it will activate Siri or Google Assistant on a Bluetooth connected phone. The only negatives that you could throw at this transmitter are it's size and the fact that you can't play media from a connected USB drive. Some might say the unit and buttons are a bit big and maybe not as modern looking as they could be. But then this is going to be used in older vehicles and will probably not bother most people. Otherwise it's all good, and the voice command feature makes it even better as it opens up a whole new level of control that you don't usually get with these devices. 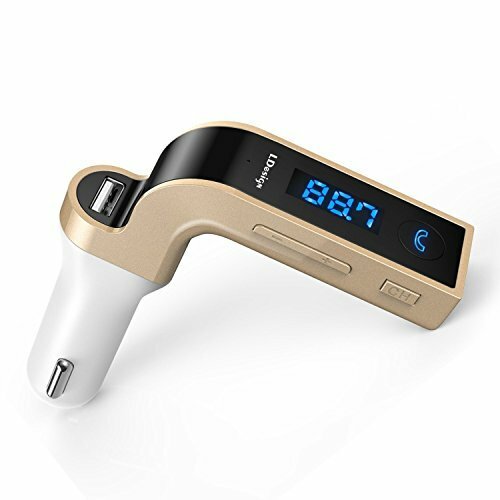 An FM transmitter is a device that you use to stream music from your smartphone, portable player or a bluetooth enabled device, through your cars' stereo speakers. 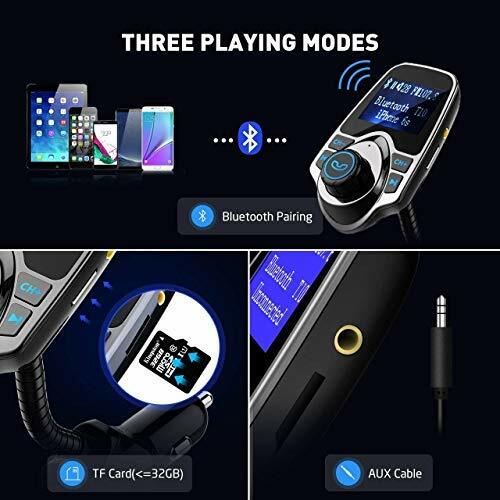 It will take the audio output (via Bluetooth or cable) from a portable device such as a smartphone or MP3 player, and broadcast it on an FM frequency of your choice. You can then set your car radio to that frequency, and the music plays back through your car stereo system. It usually plugs into your 12V DC power socket, and is relatively small. 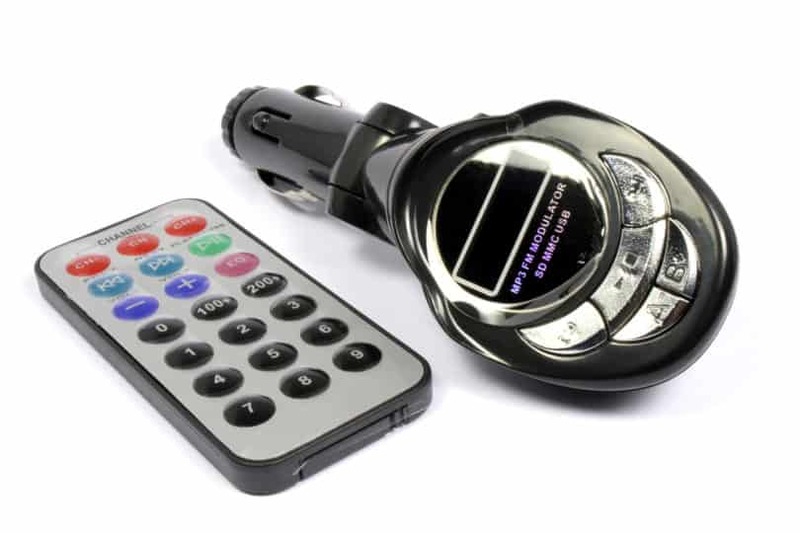 Many devices also include extra features, such hands-free calling, reporting car battery status and extra USB ports. FM transmitters are fairly basic devices, with most sharing the same features. So when it comes to picking one, it's not going to be too difficult to decipher the various features. Will the device be compatible with your car? This includes both physical elements (i.e., where your power port is located and how the geometry of the device will fit in your car), as well as more basic considerations (if you don’t have an FM radio in the car, the transmitter won’t do you any good). When it comes to connectivity you've got two options: Bluetooth and 3.5mm wired. Bluetooth is great for newer devices such as smartphones. Once you pair the first time, your phone will auto reconnect to most devices every time. No wires or fiddling with settings. Older portable devices and media players can use 3.5mm wired, and this is just as good, albeit not as tidy. Unfortunately, sound quality is not something that you can always have full control over with an FM transmitter. Nearly all of the latest transmitters will have noise cancelation and anti static technology. This makes them a whole lot better than older versions, but they're still not perfect. Depending on where you drive, you may still pick up interference (especially in built up areas). There can also be a problem finding 'free' FM channels to utilise. The main reason you're going to buy one, is for media playback, so make sure it supports the devices and file types that you plan on using. The main types of playback from a portable device are via Bluetooth and with a 3.5mm auxiliary connection. Most will also allow playback from a memory card and a USB drive also. In terms of audio file support, you'll probably want support for WAV, WMA, FLAC and MP3. Some FM transmitters have LCD screens that will display basic information such as caller ID, audio track title and even the voltage of the car battery. The LCD screen will make the overall size bigger so you'll need to decide if it's necessary or not. If you're going to use it with a smartphone, all of the info will be on your phone screen anyway. Not all FM transmitters include a USB port for device charging. Some do include chargers, but they may be low powered and won't be much use for charging bigger devices such as tablets. It's a good idea to look out for transmitters with intelligent fast charge sockets. Most will give out at least 2 Amps of power at between 12-24V. Some will also intelligently detect the smartphone that has been connected and turn on fast charge if it's supported. Whilst FM transmitters are fairly cheap and easy to install, they are not the always the best option. They have come a long way in recent years, and in most cases they'll reproduce the sound from your portable device pretty well. But they are never going to replicate the quality of a factory fitted or even aftermarket sound system. 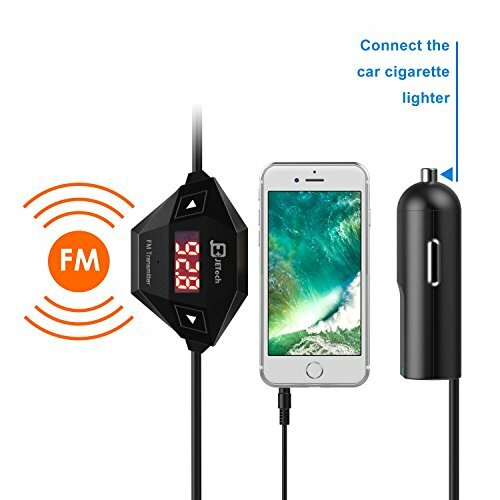 Here are a few FM Transmitter alternatives. 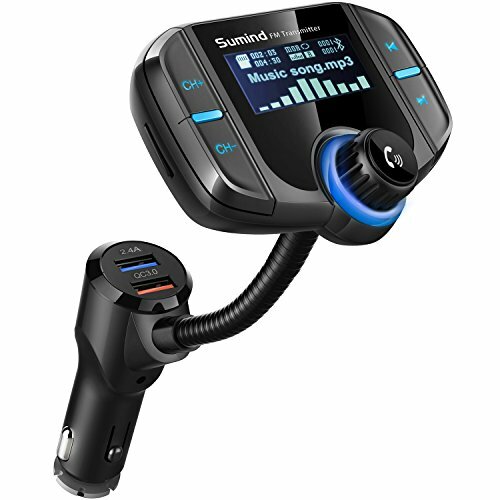 If you have the cash and or the capability to install one yourself, then a new head unit can give you the ability to connect and stream from your portable device. Depending on your vehicle, a new single din head unit or double din head unit could be the answer. There are literally 100's to choose from, and installation is not always that difficult. 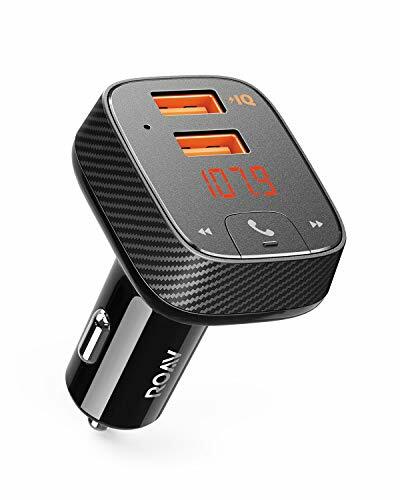 If your vehicle has an AUX audio input (it's usually a 3.5mm socket), then you can use this with a bluetooth adapter to stream music and make calls. 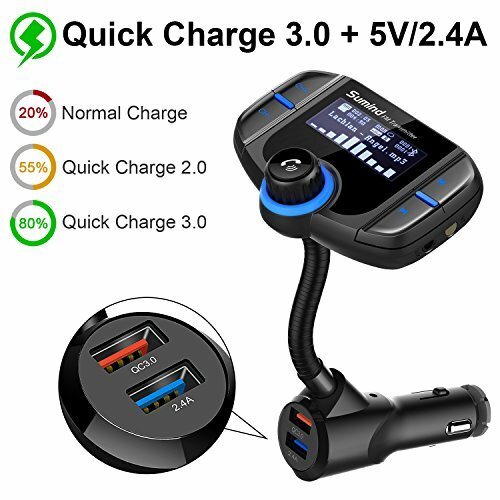 These will often deliver better quality audio with less chance of interference because you are plugging straight into the vehicle audio system. When choosing, make sure you get one with the latest version of bluetooth support and double check that you have a 12V supply to power it. This is often the best option for connecting a portable device if you want the best sound but don't want to spend much cash. If your car has an Aux socket, then you can easily hook up your smartphone or media player using an auxiliary cable.